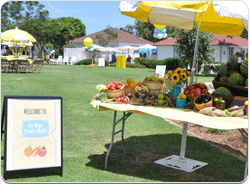 The Livin' was Easy at DocMagic's All American Family Picnic! 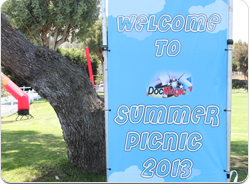 Look at us, and our adorable kids, having a blast at the DocMagic All American Family Picnic! We slathered on the sunscreen and hit the fun-zone for goodies and entertainment in a lovely secluded park in the hills of Southern California. The big, happy extended family of DocMagic employees and their husbands, wives, girlfriends, boyfriends, kids (and dogs) gathered on a sunny 80-degree day to enjoy great food and activities. The picnic included hamburgers, hotdogs, mac & cheese, tacos, ice cream, snow cones, lemonade and cold beer... along with a heavy dose of “friendly” competition. We work hard, and played harder! We challenged each other in soccer, volleyball, sack races, games of chance, and in the boxing ring. Think you can beat the DocMagic managers in a tug-of-war? Well too bad ... maybe next year!